Five more days to go. I guess most of us would be done with shopping (clothes/accessories/make-up) for Sabitri and all those dresses/blouses would have gone to the tailors for stitching. Now the uphill task is to get these notorious procrastinating guys from delivering on time. So, keep reminding the fellas that D-day is nearing. And get your shopping list ready for buying those edibles. The thumb rule - "No cooked items please". 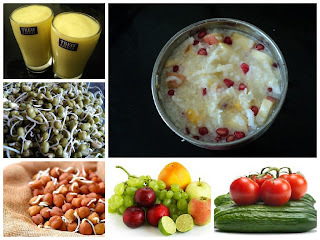 All fruits, salad vegetables, milk products, sabudana and sprouts are ok.
No sweets please unless it is 'misti doi' . Tea and coffee are debatable. Best to avoid but if you are addicted, have a cup or two to keep you from feeling cranky. No regular salt. Use black salt. The prasad usually consists of all possible types of fruits. Though most senior ladies advice you to stick to a few 'desi' fruits, people staying abroad may find it tough. So, all fruits are ok.
1. Sabudana with milk - Soak 1 cup sabudana overnight. Drain the water and mix it with 1 cup milk, 1-2 mashed bananas, 1/2 cup chopped apple, freshly grated coconut, crumbled chenna and some sugar/jaggery. Consume immediately. 2. Sabudana with yogurt - Soak 1 cup sabudana overnight. Drain the water and mix it with 1/2 cup yogurt, small pineapples pieces, apples pieces, pomegranate and some sugar. Consume immediately. 3. Fruit Salad - Take assorted fruits in a bowl. Sprinkle some black salt and black pepper powder. Add a dash of lime juice. Toss. Keep aside for 5 mins. Dig in. 4. Sprouts Salad - Take moong sprouts, channa sprouts chopped cucumber, chopped avocado, black salt , black pepper powder and lime juice in a mixing bowl. Toss together. Keep aside for 15 mins. Dig in. 5. Dahi Sharbat (Lassi)- With the mango season at its peak, add some fresh mango pulp to your dahi sharbat to make it more interesting. 6. Mango Milkshake - Chilled milk, mango pulp and sugar buzzed together for 1-2 mins. 7. Watermelon Slush - Watermelon cubes, lime juice, crushed ice, sugar and water tossed together in a blender will give you a most gratifying sip. Note - Different households have different views on what is permissible. Hence, do consult with your MIL if you have any doubts. Read more on the Sabitri Brata series Here and Here .